Cent Cols Challenge | A favourite hotel to head for? A favourite hotel to head for? When the hotel is a special treat, it helps! Todi is one of those Italian hill-top towns that so defines the abundant class of Tuscany. The road up to the “centro antica”is a dead straight 1km of 11% : a tough way to end a stage. But so worth it. I had to take riders through the narrow, winding streets before heading out of the fortified walls to our hotel. The Villa Luisa is set in it’s own little park, secluded and perched on the hill-top ridge. 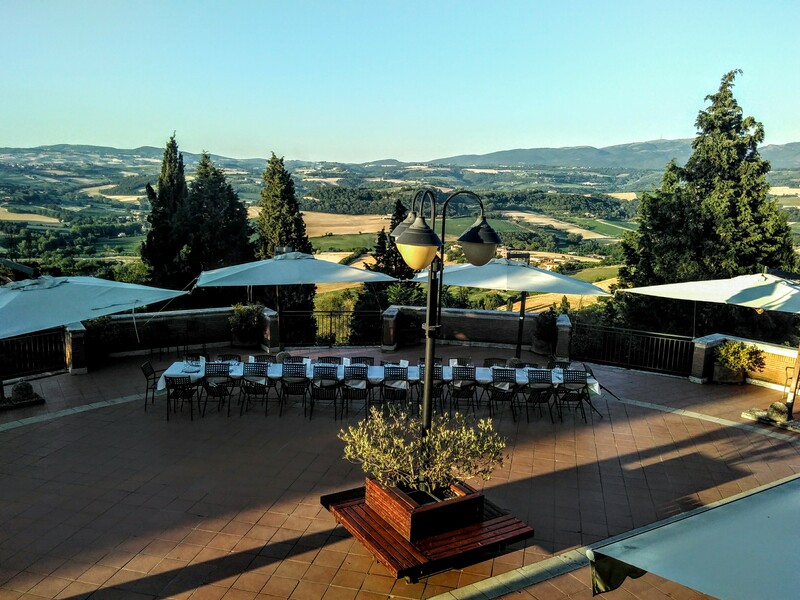 There is a banquet room with a 180° panoramic view of the gentle, but even better is the terrace where we were lucky to enjoy one of the most civilised evenings I have ever had on a CCC event. But however good the setting might be, and however refined (and plentiful) the food, in the end what counts above all is the welcome from the staff. Catia runs this place with pride and such care for detail. This is one of several hotels on each event that riders wish coincided with our “Rest Day”. After the mighty remoteness of the Gran Sasso, the rolling Tuscan hills are quite comforting, especially seen from such a viewpoint. The very first edition of the CCC started and finished at this hotel. ( Hotel Beauregard, Sevriéres) It is one of the nicest hotels on the shores of Lake Annecy ( and takes more than it’s share of the event hotel budget!). It is also very sentimentally linked to the history of the Cent Cols Challenge. For three years we started here, then for couple of years I reversed the route and we had our rest day here, having started in Nice. It’s not a bad place to stop for a day! The hotel gardens go right down to the cycle path that circumnavigates the lake. I feel really lucky that this hotel keeps welcoming us back because we are not really their “usual” type of client! To contemplate the sublime Lake Annecy and the mountain views all around used to be just the perfect way to get in the mood for the event. Now we stay here after stage two of the Northern Alps, after a tough 210 kms ride, culminating with the Mighty Semnoz climb and a fabulous descent to this lakeside hotel. Exhausted we may be, but the hotel still leaves no one indifferent. I still think that anyone who lives in or near Annecy either got lucky at birth or made a very good choice at one point in their life! To me Annecy is pure Alpine Best, in so many different ways. San Pellgerino Terme is tucked into a narrow, steep-sided valley, built along a gushing river with several ornate bridges linking the two sides. Despite many signs of a more glorious past, the town hums with life during the day, but then really buzzes at “Passegiata” time : that moment in the evening when everyone HAS to go out to see / be seen and be very Italian! The town is world-famous of course for it’s sparkling water, but it’s also known for it’s special biscuits, for which our hotel ( Bigio) is one of the best places to find them. The hotel fits so well into this mix of past & present : rooms have high ceilings; corridors are wide enough to be rooms themselves; it has it’s own park, with a fountain, outside eating area; it has it’s own Pasticceria, with the famous home-made biscuits and perfect Italian coffee; and naturally it has it’s own Gelateria for the perfect end to the day. I have stayed here for 11 years now and even the cleaning ladies still seem to be same. They remember me from one year to another. So welcoming. Yet the hotel is not pompous in any way at all. In fact we stay in much better ones on this event. This hotel is simple, modest and understated. Dinner is first class but breakfast is almost too casual. Staff will smile but above all are just themselves. Natural. Then there is the view at the back up to the Victorian-style Casino, recently restored, and at the front of the Hotel Grande ; a 200-room hotel that has been empty for nearly 20 years but is about to be saved…. Most impressive of course are the views up to the top of the super-steep hills that enclose us on both sides : it’s just the perfect place to start & finish our journey. It is so easy to touch a sense of anticipation that this place offers us. Despite staying in some much more remarkable hotels than this on the event, this is the place I still love to return to most. I discovered this pearl when designing the WP route. I arrived at 7am, after driving the Col de Portalet in the dark one morning, late October. I was not expecting to find any sign of life, but a sleepy-eyed lady greeted me and ushered me in for coffee, asking what I was doing here and at this time of day! The rooms were a dream, the welcome obviously as best as you can find, BUT the were not enough rooms for a usual-sized group. There was a hotel-split option, which is not great. For 2017, we had to stay in the next town down the mountain into Spain. Very good too, but when we had not choice in 2018 ( the other hotel had shut) , I went for this one. Luckily, in a non-commercial way, our group was small enough for us all to get into this hotel. It is looking like a similar plan for 2019, with just 8 riders signed up at the moment. 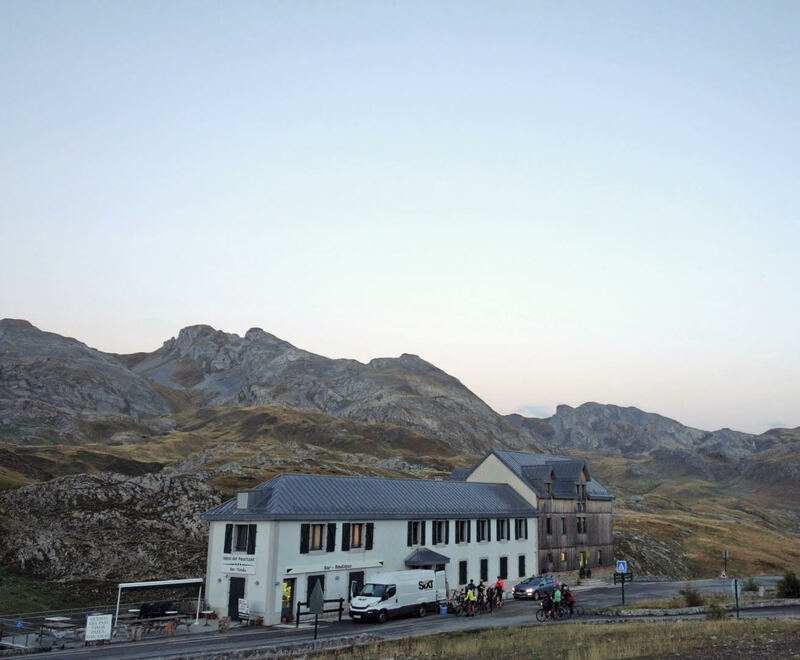 To arrive at this place at the end of a 27km climb from the foot of the Aubisque, and at dusk, is a moment no-one could possibly forget. We arrived with thunder rolling around the hills, and a setting sun painting the sky vividly! We just made it before the heavens opened, and had a superb evening with dinner cooked by their young Michelin starred chef, who work there so that he can ride his bike in the area between shifts!! This place is somewhere to come back to for a holiday. But it’s not bad for a bike Challenge stop-over either!